We knew it would be an interesting book when Isabel originally presented it to us, but Nick has surpassed himself with the research and the interviews he’s secured to produce something we’re very proud to be publishing. The party attracted many agents, designers, sales reps, packagers and other publishers, as well as an impressive turn-out of fellow Omnibus authors. It was fantastic to have Paul ‘Smiler’ Anderson, Celeste Bell, Daryl Easlea, Zoë Howe, photographer Michael Spencer Jones, Simon Wells and Paul Woods there to help us celebrate, as well as Jill Adam from the Louder Than Words festival at which Nick was a guest last year. And I’m pleased to say that the celebrations continued long into the evening round the corner at the Warwick Arms. 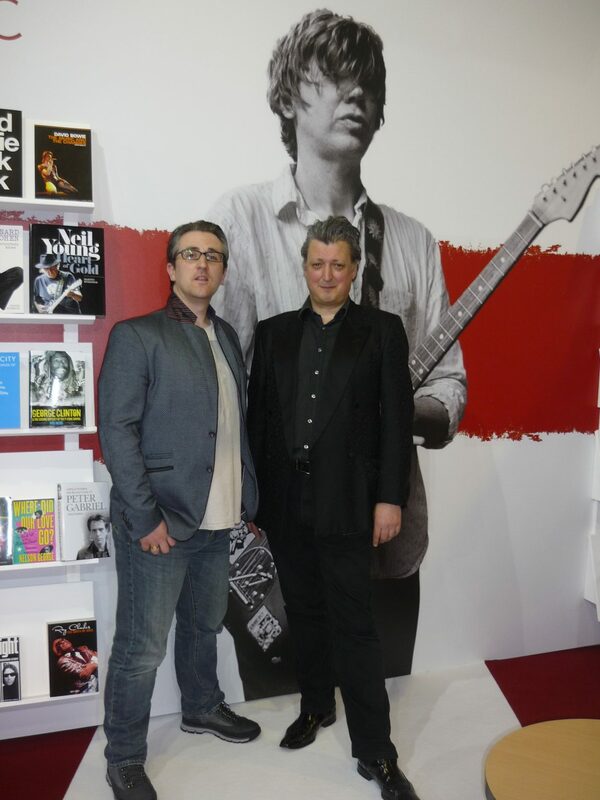 (At the book launch: Author Nick Soulsby and Managing Editor at Omnibus Press, David Barraclough. London Book Fair 2017). Arriving at a packed location – hundreds of publishers, agents, printers and other components of the book industry – then realising that there’s a nine foot tall image from one’s work looming over a publisher’s stand was quite a moment. Genuine delight that a publisher would do something so amazing; a feeling of pride that something I put together was drawing eyes and attention to a real giant of modern music. The team from Omnibus – and invited authors – were a pleasure to be around and also to listen to: each person has a different perspective on what it means to be part of publishing and I tried to absorb all I could. Alongside the image of Thurston was a giant image of Stevie Nicks and the most surreal moment of the night was when a lady who looked just like her drifted in to visit the stand – I was so surprised I actually did turn and ask her “excuse me…But are you this lady here?” Gesturing toward the picture. “Oh, if only I was!” She responded and I lost her again in the swirl of people – so I’ll never know who the mystery guest was. That’s OK, what I took away from the night was a sense of the people who put their time and energies into making projects that can take years to come to fruition, into physical realities. They made me smile and I knew I owed thanks to many people around me – I hope I made it round them all but I suspect I owed more. 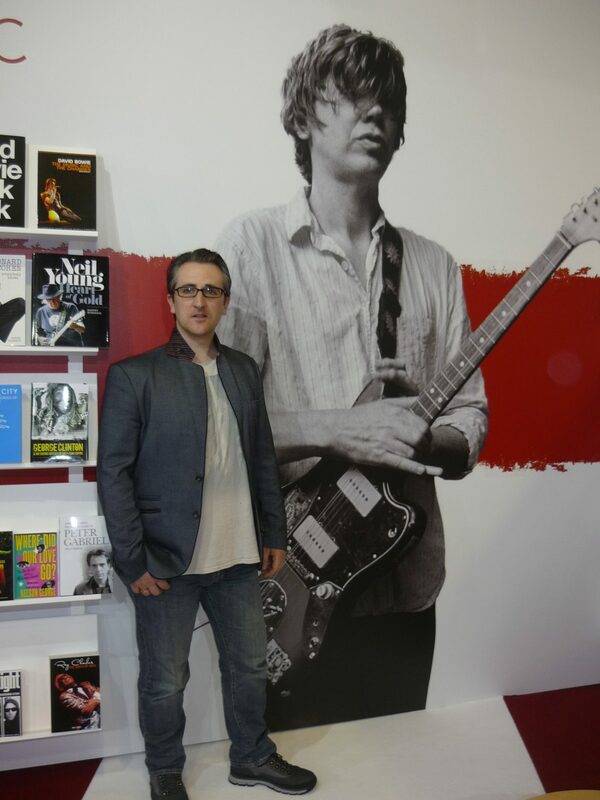 (Nick Soulsby on the Omnibus Press stand with an enormous picture of Thurston Moore!). Nick’s book is out now! You can find it online and in all good bookstores.